Ok, maybe not the Trophy – but this gorgeous kitchen could be! After all the nail-biting tensions of the last few weeks, wouldn’t you love just to relax, get together with friends, cook, eat and put the world to rights in this fabulous setting? With its beautiful, bold England-flag red island, with curves as smooth as a John Stone pass (too much maybe?) 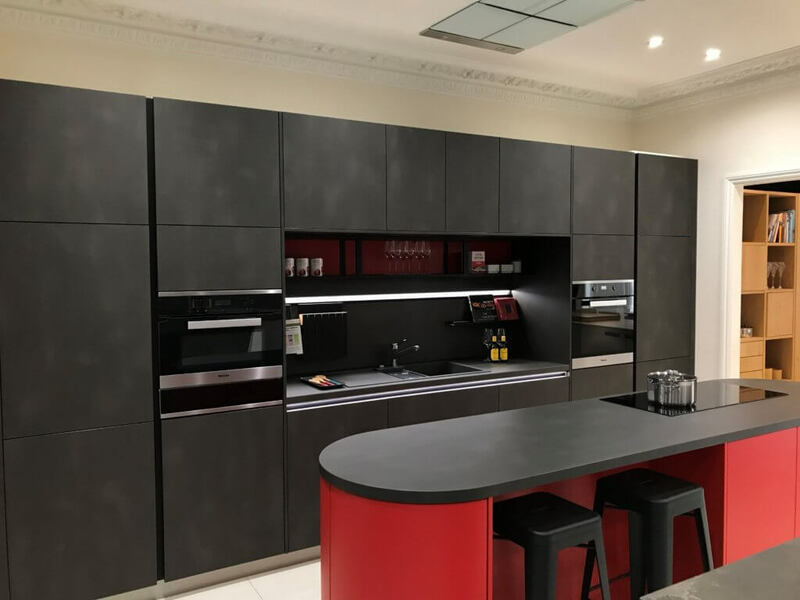 and offset by the striking Dark Steel-effect wall cupboards, this delicious Schuller kitchen would be an inspirational and visionary addition to your home. It’s on display in our Uxbridge showroom, so come and open cupboards, play with drawers, run your fingers over work surfaces and marvel at our mouth-watering new Miele appliances! And while you’re here, have a chat with us about bedrooms and studies as well (or maybe just about football! ).